Side dish: Whether you’re holed up in your house or on stakeout in a car, you will want to eat something that won’t cause flatulence in an enclosed space. Pumpkin is supposed to be less likely to cause bloating and gas, and it’s in season right now. Here are 17 Delicious and Healthy Pumpkin Recipes. That means at least five days of fresh air. Nam Da Jung (Kim So Eun) is crying in defeat over losing her prize money. Meanwhile, loan shark, Jo Dal Goo (Jo Jae Yun) is rattling on her door, trying to rally her to action. He manages to entice her with the prospect of help from his jail buddy, Professor Ha Woo Jin (Lee Sang Yoon) who is being released tomorrow. When Da Jung and Dal Goo arrive at the prison, it appears that they are not the only ones hoping to enlist the genius of Woo Jin. Dal Goo and all the other suspicious men in suits end up chasing after a newly released inmate, leaving Da Jung in the dust. The real Woo Jin walks by and offers to help Da Jung back onto her feet. When, he recognizes her as the saccharine contestant from “Liar Game”. He withdraws his hand, and walks away. Da Jung follows Woo Jin to a bus stop to confirm his identity. Woo Jin refuses to admit who he is, but tells Da Jung to stay away from a murderer like Woo Jin. 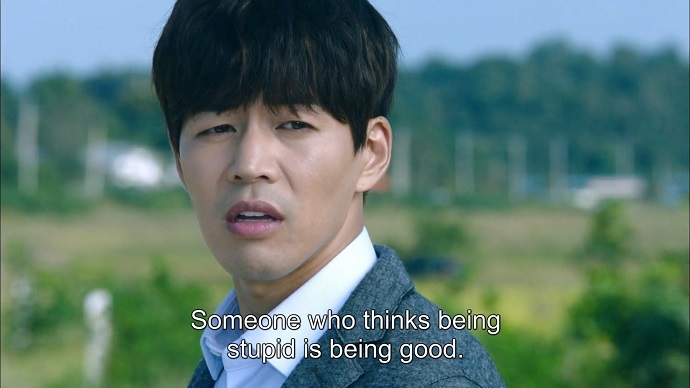 Speaking in third person, Woo Jin then says that he hates people like Da Jung who think being stupid is being good. Awesome! My new hero is then whisked away by a bus. Dense Da Jung realizes Woo Jin is the man she is looking for. She manages to catch the bus, and pleads more insistently for his help. With Da Jung trailing him, Woo Jin finally agrees to hear her story, but tells her to wait while he goes to the restroom. Having learned nothing from her experience with the old lady in Episode 1, Da Jung waits in vain. 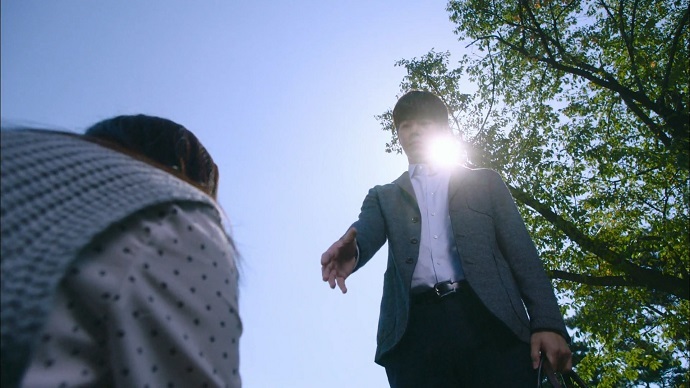 Woo Jin goes to pay respects to the dead; possibly his murder victim? Da Jung is still waiting for him at night when she is accosted by a pair of drunks. Woo Jin saves her then reprimands her for foolishly believing his lie. Da Jung tearfully defends the gullible. Da Jung’s words prompt Woo Jin’s memory of his mother dangling off the side of a building. In spite of his best efforts, she falls to her death. Woo Jin pauses long enough for Da Jung to plead her case. Woo Jin points out that a newly released convict should not be stealing money. He has no interest in helping an idiot like her. Awesome! Da Jung sadly walks away, leaving behind her TV contract. That night, Woo Jin reads it over and spots something of concern. The next day, Da Jung decides to go bother her duplicitous former teacher again about her stolen money. The teacher laughs evilly in her face. Thanks to Da Jung’s high profile loss on TV, Dal Goo’s loan shark boss decides that her life is forfeit since they will not be able to collect her father’s debt. Sure enough, the creditors descend on Da Jung upon her return home, demanding to know where her father is. Woo Jin swoops in and advises the mob to get an official contract like his, or else, Da Jung could sue for illegal collection. One of the creditors demands to see Woo Jin’s nonexistent contract, prompting Woo Jin and Da Jung to run away. Once safe, Woo Jin returns Da Jung’s TV contract to her. He questions whether she even read it, given the steep financial penalties she will incur if she fails to cooperate. Da Jung insists that she took the risk, because the prize money would mean that she and her father could resume a normal life. Woo Jin decides to help Da Jung, but only under the condition that she quit the game after the current round, and he gets half the prize money. Da Jung then gives her condition: that he never betray her. They do a pinky promise. The production team behind “Liar Game” are discussing Da Jung’s wish to bring Woo Jin into the game to help her. The crack team has already compiled a file about Woo Jin, and it is revealed that while he was charged for murder, the charge was dismissed. Woo Jin was actually jailed for white collar crime. Creepy show host, Kang Do Young (Shin Sung Rok) joins the meeting via videoconference. He defers the decision regarding Woo Jin to producer (PD) Lee Yoon Joo (Cha Soo Yeon). Woo Jin arrives at the TV studio with Da Jung, and sits across from show host, Do Young. Do Young questions why a Seoul University professor would commit a serious crime, and Woo Jin challenges Do Young’s move from the financial sector to TV. Woo Jin openly speculates that Da Jung was purposely pitted against her former teacher, and calls Do Young a fake. The two men have an intense staring contest. Back home, Da Jung prepares dinner for Woo Jin and Dal Goo, and Woo Jin notes the weird loan shark and debtor relationship they have. Woo Jin asks Dal Goo to help them behind the scenes once the cameras are trained on them. PD Lee is getting upbraided by the director of the TV station for enlisting a newly released ex-con. Do Young slithers in and points out that it is all about ratings, and ratings are on the rise. Plus, he has evidence that would make Woo Jin more sympathetic. The first step in Woo Jin’s plan is to have Da Jung openly declare her intentions to take back her money as well as the teacher’s. The second step is to do a stakeout outside the teacher’s home. During the night, Dal Goo drops off some information about the “Liar Game” show host, and some unidentified items. Da Jung and Woo Jin are keeping watch over the teacher’s house when a police car pulls up. Woo Jin quickly grabs Da Jung’s head to mimic a make out session. The cop is on the search for reported suspicious individuals in the neighbourhood. Apparently, amorous couples do not count. The cop then suggests taking their acts of love to the public park instead. Da Jung is all aflutter about having her face so close to Woo Jin’s. Da Jung does not understand the point of their stakeout. Being an Applied Psychology professor, Woo Jin knows that they are cornering the teacher psychologically. And when cornered, the teacher is staying at home, presumably with his money. The teacher wakes up to smoke and concerned citizen, Woo Jin in his house. Woo Jin introduces himself then reveals his theory about the money being kept with the teacher, and not at the bank. Woo Jin confidently declares that all the money will be theirs, sending the teacher into a paranoid frenzy. Back in the car, Woo Jin reveals his bluff; he does not actually have a plan to take the money from the teacher. With only one day left, Da Jung freaks out. Woo Jin leaves the car in a huff. Meanwhile, the teacher is increasingly optimistic about keeping the money. What follows is a montage of the anxious expressions of Da Jung and the teacher spliced with clock faces. With five minutes left, Da Jung sprints to the teacher’s house, and rattles his gate while pleading and crying. The “Liar Game” representatives arrive at the teacher’s door to tabulate the money. A relieved teacher leads the men to his stash then justifies his actions to Da Jung while taunting her. The clock is chiming 6:00 when another “Liar Game” team arrives at the teacher’s door. That is when Woo Jin reveals that the earlier team were actually Dal Goo with a hired man, and the money is now in Da Jung’s possession. A swapping of cell phones while Woo Jin was in the teacher’s house allowed Woo Jin to misinform the teacher about the expected arrival time of the “Liar Game” team. Woo Jin reveals that he set Da Jung’s watch ahead by an hour so that she would be believably desperate, since she is incapable of putting on an act. Da Jung gives over one of the suit cases of money to Woo Jin as promised, and Woo Jin walks away. Loan shark, Dal Goo chases after Woo Jin asking when he can get compensated for the money spent to trick the teacher. Woo Jin reveals that all the money in his possession will go to Da Jung when she realizes that she must return her half of the winnings as a penalty for abandoning early. Da Jung is about to leave when her conscience compels her to return to the teacher’s house. The teacher is begging her to stick by their original agreement when loan sharks burst through the door. The men start manhandling the teacher for their money, and PD Lee orders her cameraman to start recording. Outside the house, a minivan with tinted windows pulls up suddenly beside Woo Jin. The doors open to reveal a thoughtfully posed Do Young who directs him to get in. 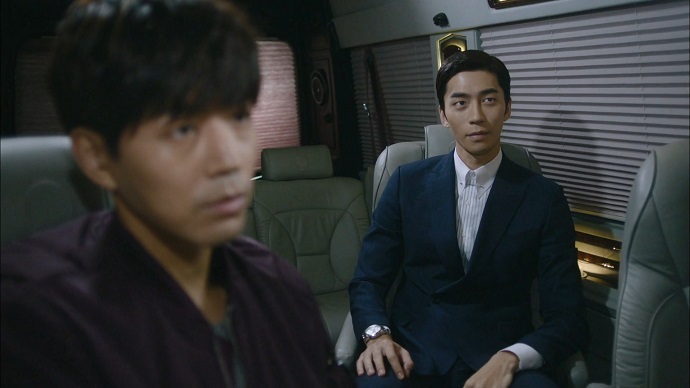 Inside the luxury minivan, Woo Jin and Do Young watch on a TV screen as the loan sharks threaten to take the teacher’s body parts as compensation. Sure enough, Da Jung steps in to protest the ill treatment of the teacher. One of the thugs pauses to offer insightful social commentary by pointing out the camera crew that did nothing to intervene. The teacher is about to sign over his body as compensation for his debt when Da Jung offers to pay it off on his behalf. Back in the minivan, Woo Jin realizes that Do Young had arranged for the loan sharks to come, thus setting up the predictable Da Jung for the sake of good television. Woo Jin hands over the brief case to pay Da Jung’s contract penalty. 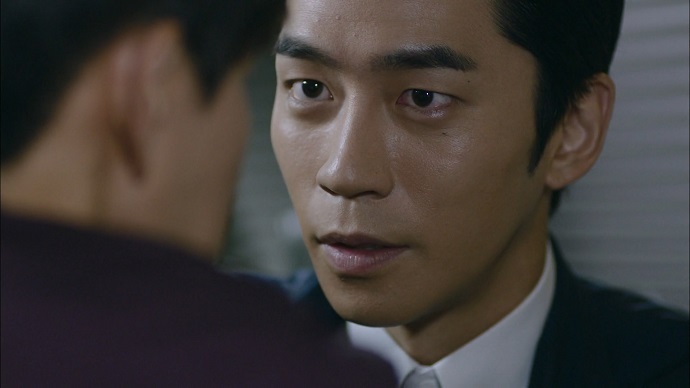 Do Young asks if Woo Jin’s act of kindness stems from the death of his mother, who was as gullible as Da Jung. Do Young then offers to reveal the truth behind his mother’s death if Woo Jin joins as a contestant. Do Young announces in his TV voice the tantalizing dilemma before Woo Jin. Is Do Young lying about possessing knowledge about his mother’s death? Will Woo Jin decide to participate in “Liar Game” in order to rescue Da Jung and take revenge for his mother? There were numerous times during the first episode of “Liar Game” that I felt like smacking the dumb look off Da Jung’s face. I was less exasperated with the second episode thanks to Woo Jin who voiced exactly what I was thinking. Sadly, it is probable that Woo Jin’s opinion will change as he is won over by the goodness of Da Jung’s heart, and his hair smooths out to match. 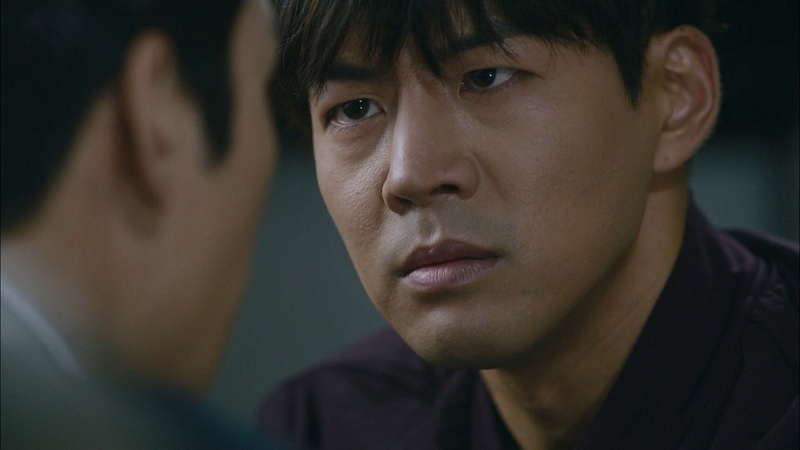 Playing Woo Jin, Lee Sang Yoon is as hostile as he can be given that his character is well on his way to redemption, starting with rescuing Da Jung from sexual assault. His interactions with Da Jung are about as memorable as the relationship between a jaded adult and a naive child. Instead, I prefer the scenes with Woo Jin and creepy Do Young, which are considerably more intense and entertaining. Shin Sung Rok may have cornered the K-drama market on creepy weirdos, though he has been nuanced enough that one can differentiate between Do Young and his characters from “My Love From the Stars” and “Trot Lovers”. The plot was clever enough and well paced. If the producers keep up the decent intrigue at a good clip, and provide more intense bitchy showdowns between Woo Jin and Do Young, I will be a little more forgiving of Da Jung’s stupid face. Just a little. Next Happy Birthday, Seo In Guk!